● Shift the shift lever to P (automatic transmission) or R (manual transmission). Pull the lever and fold down the seatback. Unhook the strap and remove the tool bag. 2.Raise the bottom cushion up. 2. Press the lid against the bottom of the lower cushion until it is supported by the hookand- loop fastener. Assemble the jack handle extension as shown. Insert the end of the jack handle extension into the lowering screw and turn it counterclockwise. After the tire is lowered completely to the ground, remove the holding bracket. Position the jack at the correct jack point as shown. When positioning the jack under the rear axle housing, make sure the groove on the top of the jack fits with the rear axle housing. Tighten the nuts until the tapered portion comes into loose contact with the disc wheel sheet. Tighten the nuts until the washer of the nut comes into loose contact with the disc wheel. 4WD models only: Fasten the claws of the holding bracket into the wheel holes as shown in the illustration. Then secure the tire, taking care that the tire goes straight up without catching on any other part, to prevent it from flying forward during a collision or sudden braking. Stow the tools and jack securely. As the temporary spare tire is not equipped with the tire pressure warning valve and transmitter, low inflation pressure of the spare tire will not be warned. Also, if you replace the temporary spare tire after the tire pressure warning light comes on, the light remains on. Improper use of the jack may lead to death or serious injuries due to the vehicle suddenly falling off the jack. ●Do not use the jack for any purpose other than replacing tires or installing and removing tire chains. ●Only use the jack that comes with this vehicle for replacing a flat tire. Do not use it on other vehicles, and do not use other jacks for replacing tires on this vehicle. ●Always check that the jack is securely set to the jack point. ●Do not put any part of your body under the vehicle supported by a jack. ●Do not raise the vehicle while someone is in it. Take particular care when lowering the vehicle to ensure that no one working on or near the vehicle will be injured. Tighten all the screws securely to prevent the extension parts from coming apart unexpectedly. Failure to do so may result in serious injury: • Lower the spare tire completely to the ground before removing it from under the vehicle. • Do not try to remove the wheel ornament by hand. Take due care in handling the ornament to avoid unexpected personal injury. • Have the wheel nuts tightened with a torque wrench to 83 ft·lbf (113 N·m, 11.5 kgf·m) as soon as possible after changing wheels. ●Remember that your temporary spare tire is specifically designed for use with your vehicle. Do not use your temporary spare tire on another vehicle. ●Do not use two temporary spare tires simultaneously. 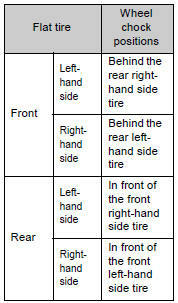 ●Replace the temporary spare tire with a standard tire as soon as possible. Do not drive at speeds in excess of 50 mph (80 km/h) when a temporary spare tire is installed on the vehicle. The temporary spare tire is not designed for driving at high speeds. Failing to observe this precaution may lead to an accident causing death or serious injury. Do not fit tire chains to the temporary spare tire. ●Replace the grommets for the tire pressure warning valves and transmitters as well.